A standard-level account on your MacBook with restrictions is a managed account. 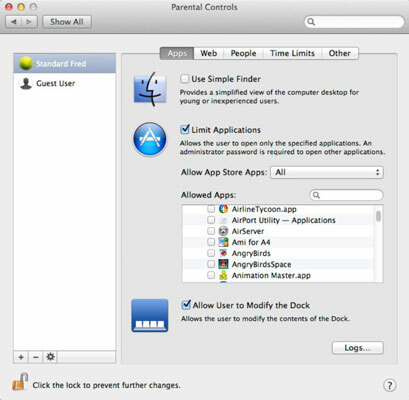 With these accounts, you can restrict access to many different places in Mountain Lion and your laptop’s applications by using parental controls. 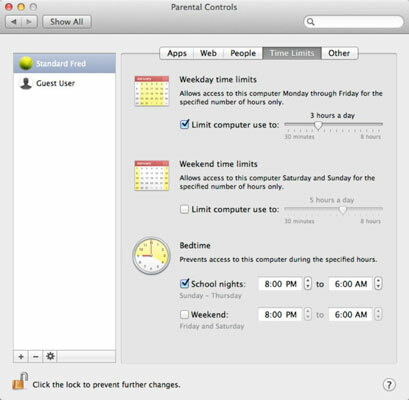 In short, parental controls come in handy in preventing users from damaging your files, your software, or Mountain Lion itself. If an account has been restricted with parental controls, the account description changes from Standard to Managed in the Accounts list. Log in with an admin-level account. Open System Preferences and then click Users & Groups. Click the desired Standard account in the list and then select the Enable Parental Controls check box. If necessary, click the Lock icon in the lower-left corner to confirm your access. Apps: These settings affect what the user can do in Mountain Lion as well as what the Finder itself looks like to that user. Allow Unrestricted Access: Select this radio button to allow unfettered access for this user. Try to Limit Access: You can allow Safari to automatically block websites it deems adult. To specify particular sites that the automatic “adult filter” should allow or deny, click the Customize button. Allow Access to Only These Websites: Choose this radio button to specify which websites the user can view. To add a website, click the Add button, and respond to the Mountain Lion prompt for a title and the website address. People: You can specify whether the user can join in Game Center multiplayer games, as well as allow or prevent the user from adding friends in Game Center. Select the Limit Mail and Limit Messages check boxes to specify the e-mail and instant messaging addresses that this user can communicate with. To add an address to which the user can e-mail or chat, click the Add button. If you want a notification if the user is attempting to send an e-mail to someone not in the list, select the Send Permission Requests To check box and then type your e-mail address in the text box. Time Limits: Parents, click the Time Limits button, and you’ll shout with pure joy! Check out the options on this pane. You can limit an account to a certain number of hours of usage per weekday and per weekend day, and set a bedtime computer curfew time for both weekdays and weekend days. Hide Profanity in Dictionary: With this check box selected, profane terms are hidden in the Dictionary for this user. Limit Printer Administration: With this check box selected, the user cannot modify the printers and printer queues in the Print & Scan pane in System Preferences. If this option is enabled, the user can still print to the default printer and switch to other assigned printers but can’t add or delete printers or manage the OS X print queue. Limit CD and DVD Burning: Select this check box to prevent the user from recording CDs or DVDs via the built-in disc-recording features in OS X. Disable Changing the Password: Select this check box to prevent the user from changing the account password. Mountain Lion keeps a number of different types of text log files. Click the Logs button on any Parental Controls screen to monitor all the logs for a particular account. Use Simple Finder: It’s a great idea for families and classrooms with smaller children. Limit Applications: When this option is selected, you can select the specific applications that appear to the user. These restrictions are in effect whether the user has access to the full Finder or just the Simple Finder. From the Allow App Store Apps pop-up menu, you can choose to block the account from launching any applications purchased from the Apple App Store or limit the user to installed App Store apps rated for specific ages. To allow access to all the applications of a specific type — App Store, Other Apps Widgets, and Utilities — select the check box next to the desired group heading. To restrict access to all applications within a group, select the check box next to any heading to deselect it. You can also toggle the restriction on and off for specific applications in these groups by clicking the triangle icon next to each group heading to expand the list and then selecting or deselecting the check box next to the desired applications. To locate a specific application, click in the Search box and type the application name. These settings can work hand-in-hand with Mountain Lion’s new Gatekeeper feature, which prevents anyone from launching applications that were not downloaded from the App Store. Allow User to Modify the Dock: Select this check box, and the user can remove applications, documents, and folders from the Dock in the full Finder. You can restrict your standard-level users even further by assigning them the Simple Finder set of limitations. The Simple Finder is a highly simplified version of the regular OS X Finder, complete with a simplified Dock that contains only the following: the Finder icon, the Trash icon, and the folders for the user’s approved applications, documents, and shared files. The Simple Finder is the network administrator’s idea of a foolproof interface for OS X: A user can access only those system files and resources needed to do a job, with no room for tinkering or goofing off.